What does Denial-of-Service Attack (DoS) mean? A denial-of-service (DoS) is an attack in which the hackers make attempts to prevent legitimate users from accessing the service. Generally, the attacker sends tons of messages asking the server or network to authenticate requests that have invalid return addresses. DoS attacks prevent the server or network from finding the return address of the attacker when sending the authentication approval, thus causing the server to wait before closing the connection. After the connection is closed by the server, the attacker sends more authentication messages containing invalid return addresses. The process of authentication and server wait will thus begin again, keeping the server or network busy. 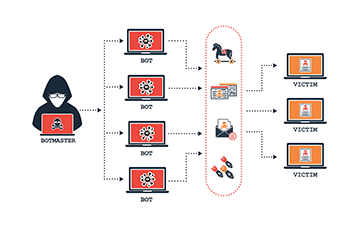 DoS attack victims very often target web servers of high-profile organizations such as commerce, banking, and media companies, or trade and government organizations. Even though DoS attacks do not generally result in the theft or loss of vital data or other assets, they can actually cost the victim a great deal of both money and time. The smurf attack is another variant of the DoS. This attack is carried out via emails with automatic responses. For instance, if someone sends hundreds of email messages containing a fake return email address to hundreds of people in an organization with the help of an autoresponder on in their email, the initially sent messages can actually become thousands sent to the fake email address. If that fake email address belongs to someone, this can go to the extent of overwhelming that person's account. Generally, experts recommend a number of strategies that you can use to prevent DoS attacks, starting with setting up an incident response plan well in advance. An enterprise will have to contact its internet service provider (ISP) if it suspects that a DoS attack is underway. This is essential in order to determine whether the incident is a real DoS attack or degradation of performance brought about by some other factor. The ISP is capable of helping with DoS mitigation by rerouting or strangling malicious traffic and using load balancers to lower the effect of the DoS attack. Management (SIEM) that can leverage data from more than 85 million endpoints in order to detect and mitigate threats even before they occur. The cWatch WAF is capable of eliminating application vulnerabilities and protecting web applications and websites against advanced attacks including such as Denial-of-Service (DoS), Cross-Site Scripting, and SQL Injection. Combined with malware scanning, vulnerability scanning and automatic virtual patching and hardening engines, the Comodo WAF that is offered to you through cWatch provides robust security that is wholly managed for customers as part of the Comodo cWatch Web solution.